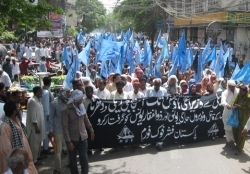 On 1 June, 2011, the International Network on Economic, Social and Cultural Rights sent a letter to senior members of the government of Pakistan to express concern regarding ongoing threats and acts of violence against leaders of ESCR-Net member Pakistan Fisherfolk Forum (PFF) who have mobilized in response to the clearing of mangroves and associated land grabbing activities. The mangroves serve as breeding grounds for fish and migratory birds and safeguards against damages from the tides, and several Pakistani fishing communities have reported increased food insecurity resulting from the loss of some 500,000 hectares of mangrove forests due to both natural and man-made causes. In response, PFF has written letters to concerned authorities and the Asian Human Rights Commission and petitioned the Supreme Court of Pakistan, as well as convening a number of demonstrations, marches and hunger strikes. Reportedly, in response to these efforts, the fishing village of Kaka Pir (in Maripur, Kemari town, Karachi) was attacked by armed assailants on the evening of January 16, resulting in multiple injuries. Attempts to file a report with the police, PFF leaders were allegedly refused and, instead, a number of false criminal charges have reportedly been filed against fisherfolk leaders. On May 5, the PFF office in Kaka Pir village was attacked and two PFF leaders, Mr. Haji Abu Bakar, President of Pakistan Fisher Folk Forum Kaka Pir village unit and Mr. Abdul Ganai Mirbahar, General Secretary of Pakistan Fisher Folk Forum Karachi Division, were killed. ESCR-Net deplores any act of violence against human rights defenders engaging in peaceful protest activities and calls upon the government of Pakistan to refrain from any threats or actions of violence against PFF leaders, to ensure protection for human rights defenders and to undertake all necessary measures to guarantee the human rights to food, water and a healthy environment for the country’s fisherfolk.